2004-06-30 Assigned to BT GROUP PLC, ACCENTURE GLOBAL SERVICES GMBH reassignment BT GROUP PLC ASSIGNMENT OF ASSIGNORS INTEREST (SEE DOCUMENT FOR DETAILS). Assignors: REID, GREGORY S.
New functions for a contact center system include: testing user's comprehension of informational messages with a quiz; capturing insight of superior users having a KPI score above a threshold by having those users submit information on why they perform so well; dynamically ordering solutions to issues by re-ranking the solutions periodically based on recency and frequency; integrating information for use by a contact center representative while online with a customer and information for use when not online; storing content items in a telecommunications industry taxonomy; directing user feedback on a content item to the proper owner/manager of that content; communicating solution information using a solutions taxonomy; displaying a dual information system having a CRM application as well as reference material that is context-appropriate; enforcing completion of a group of templates when creating a content item to be published; ensuring a group of templates for a content item are complete before publishing them; and searching within a contact center system portal using a continuum of search functions. To search within a contact center portal, a set of search functions may be provided to a user, where all of the search functions are presented simultaneously on the same screen. The user may search the content management system for results using the first search function. If the answer was not found, then the user may search the content management system for results using the second search function. If the answer still wasn't found, then the user may search the content management system for results using the third search function. The search function may be a navigational search, an alphabetic or numeric search, a keyword search, a free form search, a customer need search, and a search-by-feature search. With respect to the customer need search feature, a database may store a set of information items about specific products or services. A group of these information items may be associated to a specific customer need or intention. FIG. 29 is a block diagram of the technical components of one embodiment of the Contact Center System. FIGS. 1 through 10 show the web pages for a web-based contact center system (“CCS”) that demonstrates one example of numerous implementations of the present invention. FIG. 1 is the web page by which the CCS users can enter the contact center system portal. To keep the CCS secure and consolidate multiple login processes to all systems necessary to support the Customer Contact Center support role, a user is prompted once for his or her username  105 and password 110. Throughout this description, since the CCS is directed primarily to representatives in a contact center, the terms representative and user are used synonymously. However, because certain aspects of the system include authoring, reviewing, and publishing content for use in the contact center, the term user is also used to refer to people performing those tasks as well. In one embodiment of the home page, the page is presented as a set of tabbed pages, labeled as Home  285, Online 290 and Search 295. This arrangement of tabs allows a user to navigate between online and offline information, depending on whether or not the user is working with a customer or contact. When online, the “online” tab is clicked by the user and he or she has access to the contact center screens as well as supporting reference material. When using the offline feature, the user clicks the “home” or “search” tab for additional reference materials or for role-based capability enhancement (such as training, reading notices, checking KPI statistics, etc.) In prior systems, multiple applications were installed on the user's PC. Some applications were directed to online activities while others were directed to offline activities. The dual information capability enabled by the CCS's tabs allows a user to run only one application window of the browser program instead of multiple windows, thus increasing system performance. Since the offline and online functionality is highly integrated, certain embodiments of the present invention can leverage the integration by customizing the offline content based on what the user has recently done online. For example, when a representative user works with a customer online, but neglects to attempt to up-sell new services to the customer, when the user then goes offline, the system automatically can offer training to the user about how to properly up-sell services. The system may also proactively offer content to the user regarding upselling and customer services potential for the specific client. At the top center of the page urgent notices  205 can be displayed, which detail important new information of which a user should be aware in performing his or her job. For example, in the sample page shown in FIG. 2, there are three notices: one about updated pricing, one about the Accent Works sales campaign, and one about a learning module. As is often the case in web pages, the representative clicks on the title of the notice or the “More . . . ” link 280 to receive full information about the notice. These notices are dynamic and may change regularly. Along the left side of the web page, there are five boxes containing links to other some of the system's features or to informational webpages (either within a corporate intranet, or to external websites). These links include those to improve a user's performance via eLearning or micro-learning techniques  210, to contribute an idea to improve products, services or to solutions of a problem 215, to review information about the user 220, to perform a search of the CCS 225, or to connect to other helpful informational links 230. Along the right side of the web page shown in FIG. 2 are four regions. The first two summarize information that reflects key performance indicators (KPIs) for both the user individually  240 and the user's team or other parts of the user's organization 250. The “Details . . . ” links 245 & 255 access pages that provide further information about these KPI statistics. Below the KPI information regions, there is a region listing unread information pertinent to the user 260 (which may outline the content that the user has yet to read or review and will reduce the need to search for new content regularly) followed by a region that lists the most common solutions to questions faced by customers or contacts 270. FIG. 3 is the detailed page displayed to the user after he or she clicks on the “Details . . . ” link from the home page  245. While the key performance indicators vary depending on the implementation and use of the contact center, FIG. 3 shows four common KPI's: the average talk time in seconds, the average wrap time in seconds, the number of calls resolved and the number of calls requiring a transfer. For comparison purposes, the user's individual KPI statistics are charted against a reference number. In FIG. 3, that reference is the team average. In other embodiments, the base reference could be the user's rating from a previous period, or a pre-determined objective, for example. A textual explanation of each chart is provided to the right of the chart. For every call attended to by a user, the system records data about that call, which is used to calculate the statistics shown in FIG. 3. (One skilled in the art will understand that such data capture and statistical calculations can be done programmatically in a number of ways.) The CCS compares the user's KPIs to the team's performance averages (or other base figure). If the user is performing at some pre-established level—such as above the team average, a certain percentage above the median or mean, a standard deviation above the median or mean, etc. —then the system automatically provides a link  330 asking the user to share his or her insight on what causes such good performance. Clicking on that link 330 or 340 opens a window (FIG. 4), into which the user enters information regarding how he achieves such superior performance levels. Upon clicking the submit button 410, the system stores this information. The insight gained from the high performing users can be used in many ways. In one example, information gleaned from these submissions is used to create an informational message that is presented to users that are not performing in such a superior fashion. This type of message is displayed when a user clicks on links such as 320 and 325 from FIG. 3. The KPI comparisons are used to motivate users to perform better. They are also used to gather insight from good users and to offer training moments to underachievers. Returning to FIG. 2, CCS provides a Top Ten Solutions box  270. This solutions box provides the CCS user with instant access to the solutions that have been most often accessed by all CCS users or solutions that are considered critical by Contact Center management. Thus, it presents a quick way to use the home page to present the most used information without cluttering it with solutions that are rarely accessed. Of course, while FIG. 2 shows 10 solutions, the number can be changed to another number without impacting the spirit of the invention. While the solutions shown in this region 270 can be manually chosen by administrators, in one embodiment of the CCS, the solutions are dynamically arranged. That is to say, a solution's rank is a function of the frequency and/or recency by which that solution has been accessed within some defined period of time. To maintain this dynamically changing list of solutions, the system stores data about each solution, including for example the last date on which the solution was accessed, the number of times each particular solution was accessed on each particular date, etc. This data is then evaluated by the system to rank all solutions, displaying the top ten solutions in the top solutions box 270 shown in FIG. 2. Therefore, the listing reflects those solutions of most recent interest to the users and/or of most frequent interest to the users. There are numerous ways to implement this dynamic list. In one embodiment, the ranking of the solutions is calculated each night. In another embodiment, the list is refreshed every hour. The list can even be re-ranked each time a solution is accessed. This method has the advantage that the list closely mirrors the problems currently being researched by the representatives. If an unexpected emergency occurs, while the system administrator can post an urgent notice  205 to the home page, the solution to the problem will quickly bubble up the rankings as more and more CCS representatives search for the solution. In the embodiment of the solutions list shown in FIG. 2, the title of each solution displayed in the top solutions box  270 is itself a link 275 to more information on that solution. A user clicks on that solution title, and is taken to a separate web page, of which one embodiment is displayed in FIG. 5. The information presented in FIG. 5 is arranged in at least one embodiment through an Expert Solutions taxonomy. For each industry supported by a CCS, the goods or services serviced have a unique arrangement of dependencies, relatedness, and issues. The Expert Solutions taxonomy provides a structured presentation to the CCS user of information to solve the problems presented by customers. The taxonomy (a.k.a. content architecture) is based on the patterns of the types of data and should be intuitive to the CCS representatives. FIG. 5 shows a link at the bottom of the web page  550 that encourages the user to contribute feedback. By clicking the link, the user can then type a comment explaining any errors in the content, rating the usefulness of the content, adding comments for content improvement, etc. The CCS routes this feedback to the content-owner or an advocate for the content owner. This system is advantageous over the prior art. In traditional systems, the end users of a CCS may get frustrated when they are faced with inaccurate information in the system. If the user is not empowered to correct these mistakes, the user's confidence in the system wanes and other users continue to be presented with the inaccurate information. Some systems list a central contact for all users to call or e-mail regarding problems with the system. The contact person may receive dozens of comments or questions daily and thus may be unable to keep up with the requests. When the contact person works to correct a mistake in the content, that person must determine which author, reviewer, manager, or team is responsible for that particular element of content. This is a burdensome task that is been addressed with this invention. The taxonomy used in the CCS shown in the figures groups information for a solution into several headings, including one section detailing the general solution ( 510) and further questions to ask the caller (520), a second section detailing exceptions to the solution (530), and a third section detailing contact numbers for further information (540). Solution information is stored by the system in a taxonomic tree or hierarchy, one embodiment of which is shown in FIG. 6, using the solution titles as general reference points (the trunk) around which more specific information is grouped (branches). This method of arrangement simplifies access by users, allowing them to locate more efficiently the information that they need. The urgent notices information box  205 provides links to web pages regarding the listed urgent notices (e.g. details 280) as determined by the user's role. Clicking on the link takes a user to the update notice, which provides information to multiple users regarding new information, updated information, or alerts (FIG. 7). Once the user has read and understood the material presented in the notice, he or she may be required to take a quiz on the subject. Quizzes may be conducted based on a random generator, based on the user themselves, based on the content provided, based on the time or date, or based on any group or groups to which the user belongs. In the webpage of FIG. 7, there is a link 710 that is clicked to go to the quiz. The link brings up another window, an embodiment of which is shown in FIG. 8, which presents a short quiz to the user. Once the user takes the quiz and clicks the submit button 805, the system will store that information. The quiz allows the system to capture the user's understanding of the information presented (such as new information, an alert, or an update to pre-existing information). The quiz results may be used by supervisors and others to improve a user's understanding of new information, to modify the method by which the information is disseminated, or to track what new knowledge users have acquired. Without the quiz function a manager or administrator cannot verify whether the material was read or understood. Depending on the user's quiz results, corrective information can be sent to the user to improve the user's understanding of the information. FIG. 9 shows one search screen for a CCS. Note that the continuum of search facilities are provided on the left side of the display. In the example of FIG. 9, a representative can search by a keyword  905, via a hierarchical categorization 910, by an alphabetic index 915, by customer needs (a.k.a. customer intentions) 920, or by a drop down list of keywords 925. FIG. 10 shows the result of a representative using the alphabetic index search  915 by clicking on the letter “B” 1005. The right side of the display shows the results from the search. Notice that all of the results are products that all begin with “BT.” In this example, the alphabetic search is not the easiest method to use. As the figure shows, since the results appear in the right side of the display, all of the continuum of search functions remain available on the left side of the screen so the user can easily move on to another type of search. FIG. 19 shows a service representative in the middle of a categorization search  1910. By pausing the selection pointer over the “Products” label (or by clicking on it), the next level of hierarchy is presented 1905, which includes the categories of “search by feature,” “analogue cordless phones, “ “corded phones,” and “digital cordless phones.” By then selecting “search by feature” further subcategories are presented 1910. FIG. 20 shows the resulting webpage when the user continues the search by choosing the “search by feature” category. The user is prompted for the type of product  2005 and key features 2010. Based on these parameters, the search results are displayed to the user 2015. The user can choose to continue his or her research by comparing the chosen product against a second product 2020. FIG. 21 shows the results of such a comparison search. The categorization search  1910 just demonstrated for products offers different result formats depending on the category. For example, FIG. 22 shows the results returned when the “services” category is chosen followed by the “select services” subcategory and then the “BT Answer 1571” subcategory. Here, the results are shown with a summary section, a section describing key selling points, and a third section with recommendations for ideal uses. Additional links for this service can be accessed in the second column of the screen (such as “pricing,” “highlights/overview,” etc.) FIG. 23 shows some of the categories available under the “procedures” division. FIG. 24 demonstrates the keyword searching utility  925. In that figure, the keyword “budget” has been chosen and the results 2405 are displayed on the right side of the screen. FIG. 25 demonstrates a powerful search utility—the “Search by Customer Needs”  920. There are some circumstances that a customer will present an issue that is not readily defined by a single keyword or category. Or, that issue might be associated with numerous other categories which would not normally be associated. For example, in the telecommunications industry, when a customer dies, a landlord may call the contact center to have the service disconnected. Or, the customer may have many questions about the concept of being billed for an ancillary phone service by a third party, such as Internet access by an ISP. While various representatives would look under different keywords or categories, these situations can be grouped by describing what the customer's current needs are or what the customer's intentions are. A single click on the proper customer need 920 displays a mind map of the relevant concepts, along with frequently asked questions 2510 and related links 2515. The user can then easily choose which concept best fits the situation, such as how the act of the customer moving home may result in a charging dispute 2520. Of course, one of the primary purposes for a CCS is to assist with the representative's interaction with customers. A CRM product is used to capture, store, and retrieve customer information during the interaction. The present invention provides integration between the various functions and a CRM product. FIG. 26 shows one embodiment of the information displayed when the user clicks on the “online” tab. The screen is divided into various regions. In the FIG. 26 example, the two primary regions are the CRM contact center application on the right side  2605 and a reference utility on the left side 2610. While the present invention may integrate with any of a number of CRM contact center applications, for the example shown in FIG. 26, the CRM contact center application provides customer name, address, and similar information. It also informs the representative the products and services currently owned by the customer 2615. A call log 2620 allows the user to input details about the interaction for future reference. The history of calls are available for retrieval in the Past Activity region 2625. The reference utility area  2610 can display one or more types of reference material. The example of FIG. 26 gives the user the ability to search for products/services 2630, lookup solutions to problems 2635 or find out about procedures 2640. The searches can be accomplished through a continuum of search utilities (as discussed above). For example, an alphabetic search, a keyword search, a natural language search and a category search are shown as examples of such a continuum. This online display simultaneously provides the user with both the CRM access as well as the reference access. These two regions are dynamic and integrated, such that they are context appropriate to one another. For example, when the user is in the Products field  2615 of the CRM application, the Products/Services search can be automatically displayed in the reference region 2610. Later, when the user is in the call log region of the CRM application 2620 and is typing in the user's question or problem, the reference region 2610 can automatically search on the call log's description and display the most relevant expert solutions. This integration of the two areas of the CCS helps the user to respond to the customer more easily and more quickly. By prompting the user with context-appropriate data, a newer user can appear to the customer as a seasoned expert. Content publishing and management is well known in the art. However, it is not without problems. The present invention CMS automates many of the problems in current content management systems. FIG. 27 shows one example of a software interface which is one of the first used in adding new content. Here, the user assigns the new content to a primary category within the previously described taxonomy (by choosing one of Product, Service, Procedure, or Jargon Buster Item)  2705. A title associated with the content item is entered 2710 and the author identified 2715. To enable the content item to be correctly retrieved by the continuum of search utilities, keywords, user intentions and the correct category are all entered (2720, 2725 and 2730). Finally, the person who is charged with reviewing and approving the item is selected as well as the milestone dates—such as the commission date, write by date, publish by date, and expiry date ( 2735 through 2755). These dates are used as due dates for the various steps towards publishing the content item. The present invention uses a data structure that determines the proper set of templates that are required based on the type of content to be added. For example, in FIG. 27, a product has been selected in the family filed  2705 and more specifically, that product has been declared to be a cordless analogue phone in the category field 2730. Based on this information, the CMS can choose the proper set of templates and present them to the appropriate users. In the example of FIG. 28, each template is presented via a generated task. Thus, when a user set up the system for a new service known as the “Home Highway” service, the following five templates were determined to be required: Overview/Highlights, Ideal for, Full description, Benefits and Recap. The author's task list has five tasks added (2805 through 2825), one for each template. The due dates 2830 are based on the milestones previously entered (2740 through 2755). The task lists (also known as a person's personal work stack) supplies the user with his or her tasks by deadline. By tracking the work accomplished on the assigned templates, the system can display a progress report, showing whether the content item is on track or is behind schedule. As one skilled in the art recognizes, there are many ways to install and operate a CCS/CMS. However, one preferred embodiment is illustrated in FIG. 29. In FIG. 29, the system consists of a series of PC's  2915 used by the representatives in the contact center. These are connected via a network (such as the Internet or an intranet) to a web server 2920. The web server 2920 receives requests from the PC's 2915, and serves the web pages to them. To support the integrated view through the CCS/CMS, the web server is integrated to various other servers, including a CRM application server 2930 (running a CRM application, such as SIEBEL CALL CENTER developed by Siebel Systems, PEOPLESOFT CRM offered by PeopleSoft Inc., or SAP CRM by SAP AG) and a content management server 2925 (running an application such as DOCUMENTUM 4I ENTERPRISE CONTENT MANAGEMENT PLATFORM by Documentum, Inc.). The servers access databases storing varying data, such as databases 2905 and 2910. For example, in the above example, article  1149 contains text dealing with the key features of the Freestyle 60 analogue cordless phone. Article 1149 is one of several articles on the Freestyle 60 phone (others cover subjects such as highlights of the phone, the phone's price, and the phone's availability). All of these articles belong to an object called Freestyle 60 which in this case is a phone. 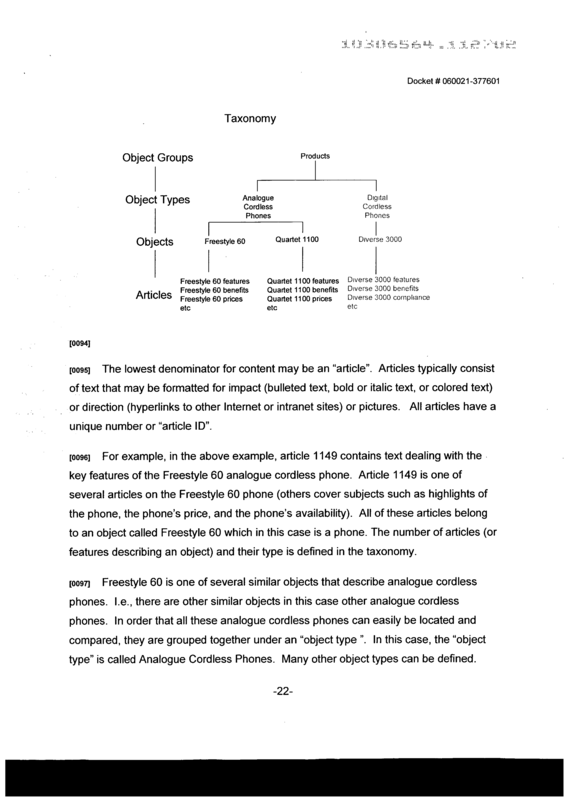 The number of articles (or features describing an object) and their type is defined in the taxonomy. As shown in FIG. 26, the system can be integrated with CRM applications. Since many CRM applications now have web-based user interfaces (such as Siebel  7) this integration can be completed using protocols (such as HTML and XML) that allow the system to integrate with many differing CRM applications. The knowledge management (KM) system can be set to display information relevant to the task currently being performed in the CRM application. In one embodiment of the invention, a web page built using ASP is used to commission a new object, such as a phone or a discount scheme. This creates a new entry into the Object table in the database. When an object is created, the taxonomy in the database describes the number and type of articles that need to be created in order to describe this type of object. For example, an object such as an analogue cordless phone requires  12 articles to fully describe this object. These articles include a highlights/overview article, an Exclusions article and a Benefits article. These types of articles have templates associated with them which force the writer to include the correct type of information when inputting the content. Other types of articles (for example a compliance article) have a different template associated with them requiring different information to be input. (A) The hierarchical categorization search may be generated from the content taxonomy which is stored in the database in the object 13 groups, object_types and objects tables as explained in the technical aspects of the telecom taxonomy section. ASP pages may take this structure and the objects contained within it and display them as series of fly out menus. Users can click on the menus to select a particular object such as a phone. wherein the first, second and third search functions are all present simultaneously on the same screen. 2. The method from claim 1, wherein the first, second, and third search functions are chosen from the group of: navigational search, alphabetic or numeric search, keyword search, free form search, customer need search, and search-by-feature search. 3. The method from claim 1, wherein the first search function is a customer need search. 4. The method from claim 1, wherein the first search function is a search by feature search. 5. The method from claim 1, wherein the searching using the second search function is based on the results from the first search function. delivering to the user the set of information items associated to the customer need. 7. The method from claim 6, further wherein the customer need supported by the function is not a keyword search. 9. The system from claim 8, wherein the first, second, and third search functions are chosen from the group of: navigational search, alphabetic or numeric search, keyword search, free form search, customer need search, and search-by-feature search. 10. The system from claim 8, wherein the first search function is a customer need search. 11. The system from claim 8, wherein the first search function is a search by feature search. 12. The system from claim 8, wherein the second search unit searching is based on the results from the first search function. a delivery unit for delivering to the user the set of information items associated to the customer need. 14. The system from claim 13, further wherein the customer need supported by the function is not a keyword search. 16. The computer program from claim 15, wherein the first, second, and third search functions are chosen from the group of: navigational search, alphabetic or numeric search, keyword search, free form search, customer need search, and search-by-feature search. 17. The computer program from claim 15, wherein the first search function is a customer need search. 18. The computer program from claim 15, wherein the first search function is a search by feature search. 19. The computer program from claim 15, wherein the a code segment for searching using the second search function is based on the results from the first search function. a code segment for delivering to the user the set of information items associated to the customer need. 21. The computer program from claim 20, further wherein the customer need supported by the function is not a keyword search.